The Prince of Wales's Lodge was formed in 1787 by His Royal Highness, George, Prince of Wales, probably at the suggestion of the Chevalier Ruspini, His Royal Highness's surgeon-dentist, a zealous and benevolent freemason, who in the following year, founded the Royal Masonic Institution for Girls. The Lodge was originally intented to consist only of those who were honoured with appointments under HRH, or men firmly attached to his person or interests. 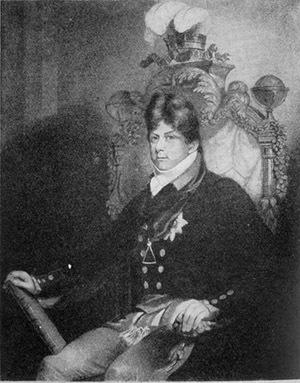 His Royal Highness, having no doubt a strong belief in and reliance on the efficacy of the mystic tie, desired to be surrounded and served by members of the Craft; this may be inferred from the fact that amongst the earliest initiated in the Lodge were twenty of HRH's footmen and household servants. They were not admitted as members, but were initiated by order of of HRH as serving Brethren without payment of fees. The warrant of the Lodge is dated 20th August 1787 and was granted by His Royal Highness the Duke of Cumberland, then MW Grand Master and signed by the Earl of Effingham, Acting Grand Master and Sir Peter Parker, Deputy Grand Master. The number of this Lodge on the Register of Grand Lodge was originally 503. In 1792 it became 412. at the Union of Grand Lodges in 1813 the number was altered to 493; in 1832 tob 324, and in 1863 to its present number - 259. The members of the Lodge was permitted to wear a border of "Garter Blue" on their aprons by order of a warrant signed by HRH the Duke of Sussex MW Grand Master dated 13th December 1830. The Lodge became a Red Apron Lodge in 1816.